FREE Community Day open to the public for fun and activities! Splash Pad, Swimming (limited guest passes), Healthy Kids Day (including local health vendors, activities, and more for kids and families! 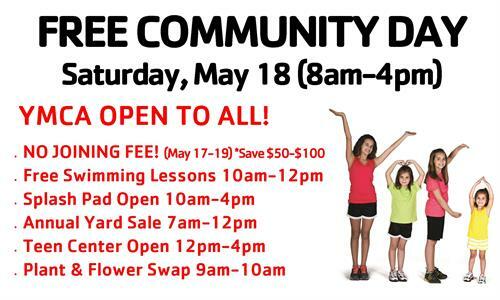 ), Plant & Flower Swap, Free Swimming Lessons (Must pre-register), Senior/Teen Center open play, and more!